Wooden Thumb Remodeling will complete small jobs, including replacement of a screen door, up to and including the design and complete construction of a custom home. We specialize in kitchen and bathroom remodeling. 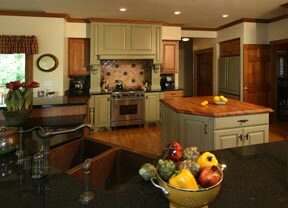 Custom Cabinetry and design are typical in our projects. As Wooden Thumb Inc. we also received a "Gold" award from NARI (National Association Remodeling Industry) for an addition in Chenequa, Wisconsin on Pine lake. 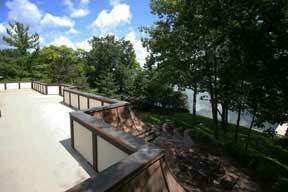 This project in Chenequa, Wisconsin was completed at cost over One Million dollars. Don't let that scare you off though. Our normal projects consist of Bathrooms and Kitchens and between $5,000.00 and $100,000 respectively. Wooden Thumb Remodeling will design your project and show you it completed using 3D Computer Graphics. Our Computer system use the CAD - Computer Aided Drafting. CAD enables us to show you your project completed, before "any" work has started. We can, and often do, take your shoe box of ideas and custom design, your project to fit those needs and wants. Wooden Thumb Remodeling will literally Design and Build your Dreams around you. We are your remodeling experts with 39 years in the business. We will work with you to find the right materials that meet the most eclectic tastes while working with your budget. Contact us for your next Remodeling Project be it ever so small or large in scope. We are the right Contractor for YOU! Brookfield Kitchen, Not every kitchen is a complete redesign. With all the options available today, there is a growing number of clients that just what an updated look. This Brookfield home owner had Wooden Thumb do just that. Chenequa Addition, Just imagine an addition where the whole roof is a lake view lookout! This 3 story addition from lake level, has just that. Wooden Thumb's featured project is a GOLD award winning project for a whole house remodel over 1 million dollars. 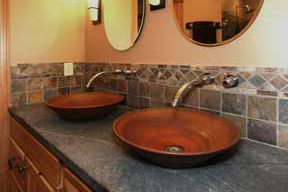 Hartland Master Bathroom, Vessel bowl sinks, natural stone products are here to stay. Hickory cabinetry, slate tile, soap stone counter-tops, make this a truly "Natural" Master Bathroom.